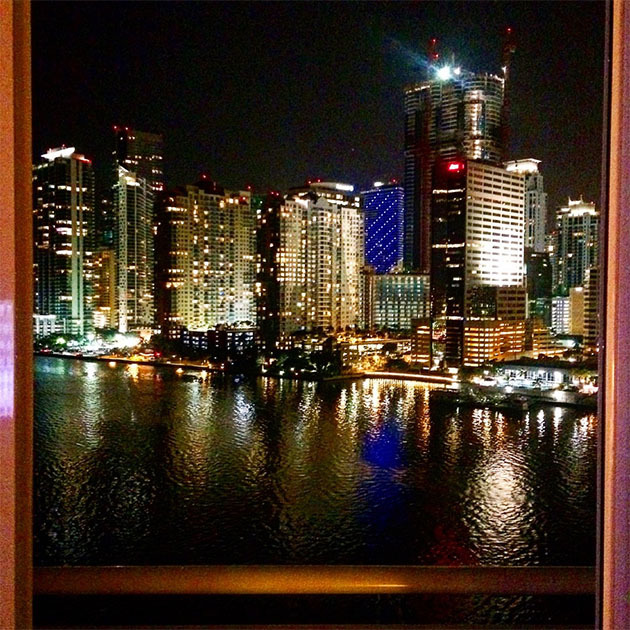 The arrival experience at the Mandarin Oriental Miami is dramatic. 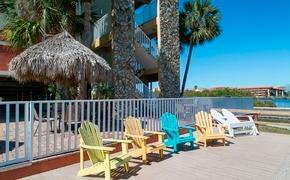 The hotel is situated on Brickell Key, immediately across a short causeway from downtown Miami. After leaving the car with valet, the hotel’s entrance is otherwise unassuming until the air conditioning and fragrance seduce your senses. Your breath escapes you as an imposing two-story glass window framing a full-length view of the water and the in-your-face downtown skyline stands proudly opposite you. Mandarin Orientals are known for their, classic Asian-inspired properties, and the Miami property is certainly true to the mold. It almost feels as though the waterfront view could easily be a closer-up version of Hong Kong, with a multicultural staff, recessed lighting and Asian artwork throughout. Guest rooms are decidedly massive: my deluxe room boasted a large foyer, Olympic-sized bathroom, and a step-out balcony with a commanding view of the skyline, similar to the one I’d enjoyed in the lobby. There were pain points, however; rather unexpected in a luxury property. Registration and check out were both grindingly slow with long waits behind other guests evidently due to complicated transactions, and the property seems not to have dispensed with the need for pre-printed paper registration cards, as has become standard in so many other hotels. The service pace at breakfast was similarly languid. The hotel seemed fully booked; although the mark of a good luxury property is that it doesn’t feel full to guests, even when it is. Aside from the waits, the food turned out to be well worth it. The breakfast buffet ($33) was a sumptuous offering of perfectly-done sausages and bacon (on buffets they tend to be cooked within an inch of their life and then dried tough under the heat lamps, but the hotel seems to have discovered a magical way to prevent this), cheese blintzes (understandable, for Miami) which were inexplicably presented without compote of any kind, but ended up being heavenly slathered in some house made banana-papaya butter I’d discovered camped out on the baked goods table. There were also waffles, creamed scrambled eggs, made-to-order omelets (behind a five-deep line of waiting guests), a remarkable selection of cheese, fresh fruit including lychee, croissants chocolate and plain, the requisite sweet pastries, and some thick crusted country bread for toast, all washed down with one of the better pots of French press coffee I’ve enjoyed in quite some time. To make it even better, it all went down on a shady terrace right on the water with the same view of the city, while crew teams rowed beneath us in the water. Morning joggers will delight in the footpath that circles the key and the waterfront park next to the hotel. For loungers, there’s a spectacular pool with a waterfront view, and the hotel has also created a beach with imported sand. Although the ocean isn’t swimmable, it’s probably the nearest strip of sand to the downtown core of Miami (which it must also be noted, requires some time to extricate oneself from via automobile upon departure). The hotel isn’t very large, but there’s a lot to the place, and little reason to leave once you’re here. In addition to the terrace there’s a lovely bar with the same great view (it was certainly lively when I arrived just past nine on a Friday evening) and offers grab-and-go breakfast in the mornings. There’s also a spa, two fusion restaurants, one Peruvian and one Asian/American, and Shanghai Tang, a delightful shop offering a wide variety of Asian goodies as gifts or keepsakes of your Asia-in-Miami experience. My objective for this journey was a little pre-cruise relaxation, and that’s exactly what I got. The hotel is conveniently located to the Port of Miami and Miami International Airport for cruise departures, and of course to the city center for those with business downtown. The Takeaway: For a luxe escapism that manifests Asian graciousness after a long journey or demanding travel workday, one need look no further. 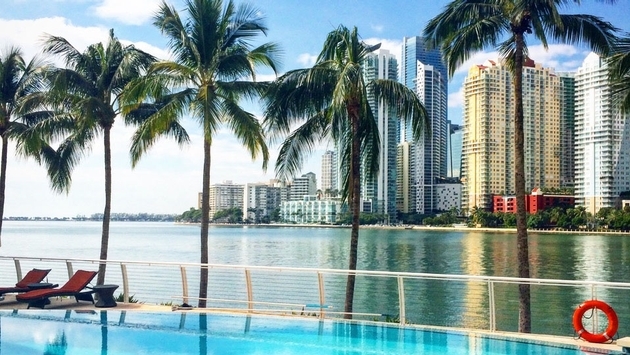 Instagrammable Moment: Whether from the pool, the terrace, the lobby, or a guest room, the view of Miami is worth a shot. Pro Tip: Don’t skip breakfast. The food is top-notch. Accommodations and some meals were furnished by Mandarin Oriental, Miami in preparation for this story.